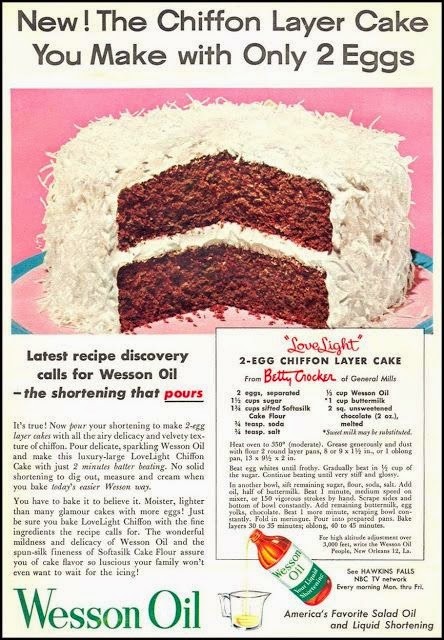 I am thinking this must have been a really popular cake for Betty Crocker. And her partner SoftaSilk flour. It is a 2 egg, Chocolate Chiffon cake. And to be honest... this is a good looking cake. It reminds me of the Hostess Snowball cupcakes. Coconut icing over a chocolate cake. Yum! Then I stumble across the same recipe again, this time for Wesson Oil. This 2 egg cake had to have been a great recipe for them. Finally here is the Lovelight Chocolate 2 egg, Chiffon Cake. In the clearest copy, I could locate for it.